Facebook, Instagram, Snapchat, Weibo, and TikTok if you are in the Asia Pacific or Greater China, all have one thing in common and it’s not just the fact that they are all social media platforms. They are all ecosystems that allow KOL marketing to become a big part of a company’s digital marketing strategy. What makes a KOL or, on a broader term, an influencer? In short, key opinion leaders are a spokesperson, a brand ambassador, or a thought leader. They are people that others look up to or aspire to be. There is a twist though: they may not be conventional Hollywood actors or charting musicians, and this is what makes them so unique. They’re young, like most users on Instagram and Snapchat, they’re relatable, and they come off as more authentic. Consumers who usually take ads and endorsements with a pinch of salt often deem KOLs as more credible. If we take a look at the highest-paid models in 2017 according to Vogue, Kendall Jenner, 22 (pretty young right? ), took first place by racking in USD$22 million a year. Kendall has 16 million fans on Facebook and 93.1 million followers on Instagram. We can see that while 16 million is not exactly a small figure, it is still some way behind the 93.1 million on Instagram. So which platform works better for KOLs? For the most part, it’s Instagram, particularly when there are increasingly more ways to reach out to millennials on the platform now, with better Instagram ads, Instagram Stories, and the recently launched IGTV. What about Snapchat? Let me introduce you to Kendall’s sister, Kylie Jenner. Earlier this year, she tweeted to her 24.5 million followers on Twitter that she is no longer as active as she is used to be on Snapchat, the result? The value of Snapchat’s parent company plummeted by USD$1.3 billion, and shares for Snap Inc. went down 6% in a day. 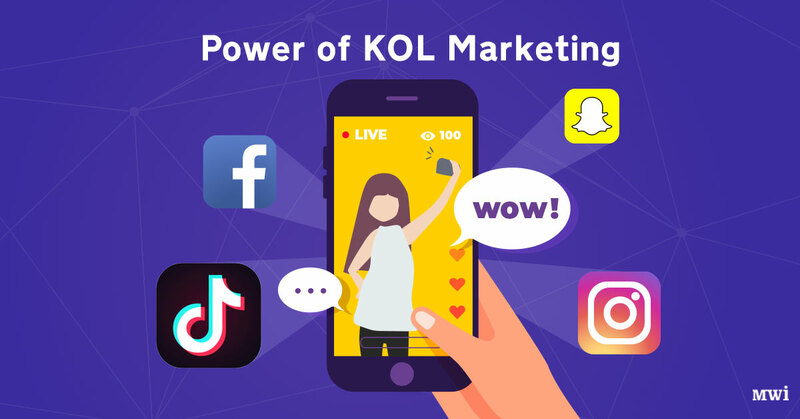 It might look like that KOL marketing is a must for any business, but before we jump on the bandwagon, we must consider the nature of your business. We have had numerous different companies enquiring about KOL services, but we only proceed with a few, our most recent being a campaign for a fitness centre. Cooperating with 20 micro influencers on Instagram and Instagram Story, we were able to achieve engagement rates of around 3.6%, handily exceeding the typical engagement goal of 1%. Extended Reading: SEO vs SEM? What’s the difference? Remember, Instagram is highly visual driven, so only consider KOLs for your marketing campaign if you have marketing assets or a product that looks good. All things fashion, beauty, fitness, food and beverage work well, but for everything else, you’ll need to plan carefully. Budgets for KOLs can vary a lot. Some companies have been known to pay up to USD$500,000 to get access to Kim Kardashian’s 9.4 million Instagram followers, while micro influencers with a couple thousand followers can range from HKD$1000 to HKD$2000. There’s a balance to be made here. Do you go and get a big social media star who may be very restricting on how your brand is portrayed, or do you go for the ones with fewer followers, but are more open to what and how they post and are more willing to interact with and advocate for your brand? Prices may go down if you have something to offer, such as discount codes or free trials, but they may go up if you need them to mention your product in a specific way or if you want to control the overall creation of the visual and copy. KOL marketing works best when you are confident about your products or services, where you can allow KOLs to speak their mind. Consumers are smart; they can tell whether it’s their beloved idol speaking to them or if it’s a forced commercial pitch. This freedom you provide for the KOL helps establish a real relationship and confidence between you and them, as well. They will be more willing to cooperate and more open to further opportunities if you consider their need and the need of their followers, too. Extended Reading: Should You Use a Free Website Builder for Your Business?